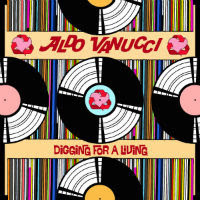 The release of the second album from Plymouth’s 14th best DJ, Mr Aldo Vanucci, is imminent – so when the chance came to premiere a track off it, naturally the monkey snapped it up. Which track to pick though, for the album is packed with dancefloor heat? It could have been a tricky but there are three classical ways to see off the horns of a dilemma – choose one horn, choose the other horn or pass between them. That last option is precisely the path selected in this case, because the closer, Spell It Out, the one non-dancefloor track in the set, featured two of the monkey’s favourite emcees – legendary Long Island duo, Q-Ball & Curt Cazal a.k.a. QnC. And as usual, they don’t disappoint. Expect them to lay down quite specifically why all other emcees don’t make the cut over string-laden, sample-laced slo-mo boom-bap – or as Q-Ball puts it “…that ain’t on my agenda/ I’m on this Aldo beat dicing rappers like a blender.” Stay tuned for the full 411 on LP, Digging For A Living shortly.